Ear infections: painful when you’re a kid, annoying when you’re an adult, and dangerous for your pets. Both dogs and cats can be affected by ear infections, but it is a more common problem for dogs. There are three levels of ear infections, depending on the part of the ear afflicted: Otitis externa, Otitis Media, and Otitis Interna. Outer ear infections can be painful and annoying, but if they persist to the inner ear, neurological damage and deafness can occur. There are many different reasons why your pup or kitty can come down with an ear infection. From ear mites (more often for cats), to rashes and allergies, bacterial infection, or even cancer or cysts. Since some conditions are far more serious than others, it’s best to check with your veterinarian to determine the cause of the ear infection before choosing a treatment plan. If your pet starts scratching at or around their ear, this could be an early sign of an infection. Other things to look out for are brownish discharge, odor in the ear, hair loss around the ear (due to scratching), crust or scabs, redness and swelling, rubbing, shaking, head tilt, unusual eye movements, walking in circles, hearing loss, or even disorientation and loss of balance. There are some factors that can predispose your pet to ear infections. Floppy-eared dogs are much more likely to develop infections. Excessive moisture (from swimming or bathing) can create an atmosphere where bacteria thrive! But be careful trying to absorb excess moisture; damage can also be caused by cotton swabs irritating the ear canal or pushing debris further back into the ear. 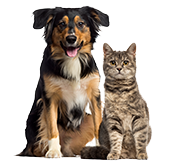 Each pet has different ears and different symptoms, so be sure to consult with your veterinarian for the best form of treatment for your cat or dog. To treat the infection, a variety of ear cleaners and washes may be prescribed in conjunction with oral medications. Be sure to follow the full course of medication prescribed, to make sure you kick that pesky ear infection for good. BNT Treatments for ear infections have been around a long time, but have generally meant applying ointment two times per day for up to two weeks! Thanks to medical advancements, a new formula is available that will clear up an ear infection with just a single application. A BNT treatment will run you about $45 a tube, and for reference, the total cost to treat ear infections is between $100 and $250 with a vet visit. Learn more about how the Healthy Paws dog insurance plan pays on your actual veterinary bill and covers injuries, illnesses, emergencies, genetic conditions and much more. Dogs and cats with allergies are more prone to ear infections, as well as those with fur that grows into the ear canal. To prevent infections in the future, be sure to have your pet’s ears cleaned regularly. 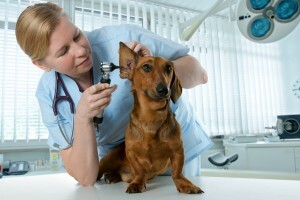 Check with your vet on how to clean your pet’s ears (very gently!) at home. If your dog goes swimming or has a bath, remember to dry completely. Dr. Kait Link, DVM, is a veterinarian and co-founder of Treat, an innovative vet practice. Treat is reinventing pet care, offering instant access to affordable in-home veterinary care, training, and grooming. Book in under a minute or chat free anytime. Download the Treat app at treat.co.